On November 19, 1723, Emperor Charles VI and his empress Elisabeth stayed at Znojmo Castle in southern Moravia where Caldara’s serenata La concordia de’ pianeti was performed outdoors to celebrate the empress’s name day. The one-act libretto by the imperial court poet Pietro Pariati is a static paean that depicts the harmonious planets marvelling to each other at the glorious beauty, wisdom and virtue of the empress ‘Elisa’. Recorded across several days of sessions either side of a concert performance in Dortmund, I’m not sure why the producer decided to edit in loud audience applause from the concert in advance of the performance, but La Cetra’s relaxed trumpet flourishes, nonchalant rhythmical inégales and timely thundering timpani during the Introduzione instantly establish the attractiveness of Caldara’s music. Daniel Behle navigates the tricky lines of Mercury’s animated ‘Tal se gemma e rara e bella’ with composure, and Veronica Cangemi is on fine form in Diana’s ‘Ad essa io cederò’, which praises the empress effusively but actually sounds rather like an operatic evocation of jealousy; its overlapping strings and lilting rhythms remind us that Caldara’s Venetian roots are not so far away from those of his compatriot Vivaldi. Franco Fagioli’s firm projective technique is displayed in Apollo’s ‘Questo dì così giocondo’, whereas his cleaner-toned colleague Carlos Mena is not entirely at home in Mars’s most stretched passages of coloratura. 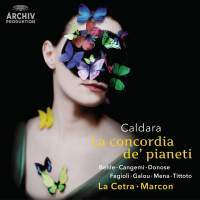 Additional instruments are utilised sparingly: oboes and bassoons sparkle playfully in Jupiter’s ‘Alla bontade e al merto’ (sung elegantly by Ruxandra Donose); Venus’s ‘Ad Elisa ancor d’intorno’ has cello and plucked continuo providing a fandango-like accompaniment to Delphine Galou’s polished singing; Mars’s ‘Da mia tromba’ features limpid solo trumpet; and a chortling bassoon contributes to Saturn’s ‘Pari a quella il mondo vede’, in which resonant bass Luca Tittoto compares Elisa’s modesty, virtue and beauty to that of her daughters. There might be more engrossing works than this one that still await rediscovery but there’s no disputing the qualities of Andrea Marcon’s crisply directed performance.